If I have learned anything from my years of experience in the entertainment industry, it is that navigating your way through it is like trying to navigate a vast, uncharted wilderness. Without a guide, it is impossible to find your way through. At the start of our careers, in 1993, Steven and I founded the law firm of Rudolph & Beer, LLP. Our practice focused on entertainment law, and much of our time was devoted to the legal protection and representation of emerging young artists. We didn’t stop there, however. Steven and I also took on the role of handling many of the bigger picture management issues that arose for our rising star clients. We realized that we were the “guides” these young entertainers needed. With the right management, career development, and counseling, we helped our clients achieve their show business dreams and grow into worldwide phenomena, such as the Backstreet Boys, *NSYNC, Aaron Carter, and Lady Gaga. During our time at Rudolph & Beer, we had met Britney Spears and her family when she was just thirteen years old. Steven and I had the unique experience of representing her at this early point in her career and developed and guided her to the point when she first signed with Jive Records in 1999 and released her debut album, Baby One More Time. We managed her throughout the early stages of her teenage career and watched her grow from a sweet Louisiana girl to an international superstar. Although I have left the practice of law to serve as Britney’s full-time manager and have been by her side for most of her career, Steven still actively practices entertainment law in New York City. When Steven told me he was writing this guide, I was excited. An important lesson we learned from our years of managing and representing young stars was that every successful child had a grounded, thoughtful, and involved support system: their parents. Without such support and a firm parental hand, any success was short-lived. I often get questions from parents in the industry about aspects of their child’s career and how to handle them but am unable to properly answer them all. This book is a great tool for parents looking for that guidance in handling or even just starting their child’s career, and there is no one better to learn from than Steven Beer. Not only is Steven experienced with high-profile entertainment transactions involving young artists, but he also brings to his work a unique management perspective that most, if not all, other attorneys lack. In his over twenty-five years of practicing law and managing artists, Steven has established many important entertainment industry relationships with various casting directors, agents, producers, directors, and other managers. 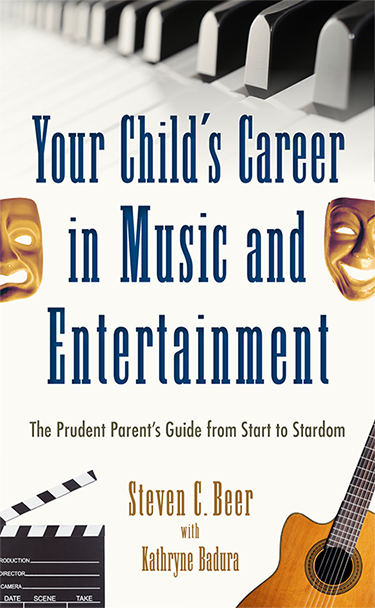 He and these industry insiders have a great deal of wisdom to impart upon parents and their children who are considering careers in the music and entertainment industry, and this book lays it all out for them in a way that is straightforward and easy to understand. As an added bonus, having been blessed with three talented boys who themselves have dabbled in the entertainment industry, Steven too has been in your shoes as a prudent parent of a child in show business. Having taken on the role himself, he empathizes with your frustrations and concerns and knows what it is that you need to know. I cannot think of anyone more qualified than Steven to guide you and your family through the difficult but rewarding journey of launching your child’s career and wish you all the best of luck!